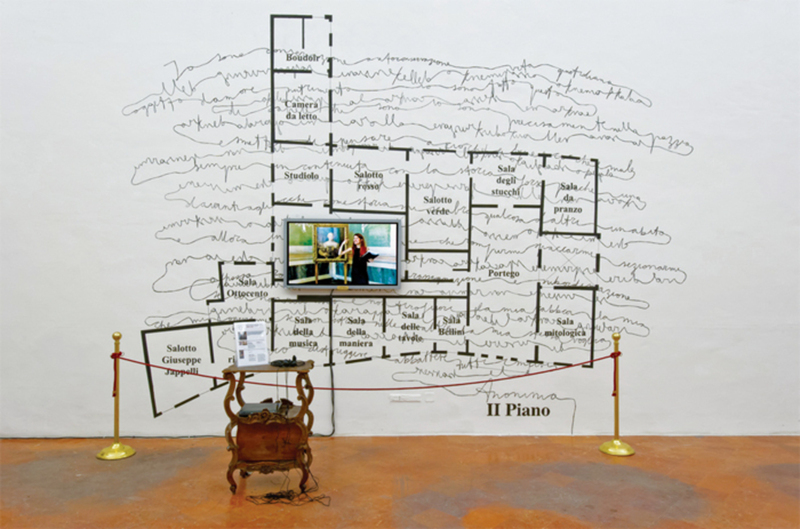 Chiara Fumai, I Did Not Say or Mean “Warning,” 2013, mixed media with video (color, sound, 20 minutes 27 seconds). Installation view. Shut Up, Actually Talk, 2013, the video installation at the gallery entrance in Chiara Fumai’s exhibition “With Love from $inister,” depicts a female figure with her contours in a state of disintegration, the hair arranged in something resembling an Afro, the body squeezed into a tight dress, the facial features taut, and the eyes wild: a phantasmagorical apparition, an ectoplasm, a coagulation of vibrations. This dramatic specter recalled the complex system of works that Fumai presented at Documenta 13, where she played P. T. Barnum’s fake “Circassian beauty” Zalumma Agra, but with the nineteenth-century sideshow attraction interpreting the words of the famous Italian feminist Carla Lonzi and her organization Rivolta Femminile (Female Revolt).